Cakes & More: Chocolate Latkes - And A Giveaway! Temptation comes in so many ways - quick, easy, chocolaty, fudgy just to name a few. And when you put all of these together, temptation is irresistible! All the more so when you are just recovering from the languor of having shopped and traveled for a family wedding and there is a sudden need to bake something quick, easy and good. Alice's Merdich's Chocolate Latkes aka Chocolate Coconut Macaroons are as easy and quick as macaroons can get . If I have understood this right, latkes are basically pancakes which are mostly (but not necessarily) made with shredded potatoes, traditionally eaten during the Jewish festival Hanukkah. Fear not, the latkes here are in no way related to the potato latkes, except in their appearance. I admit, my latkes here don't look like latkes - with the long, thin shreds of potato (coconut in this case) making them look so very appealing. Blame it on shredding coconut at home with the safest (and most easily accessible) grater you can lay your hands on. But these are indeed tasty, quite chocolaty, go from your pantry to the oven in no time at all! Crisp-ish exteriors, chewy within, coconut and chocolate flavors in each bite. A burst of dark chocolate here and there add to the chocolatey-ness. Perfect to bake for that emergency need for a chocolaty something! On the side, Cakes And More turns 3 shortly! 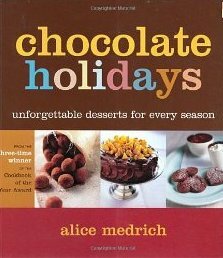 I am happy to give-away a copy of Alice Medrich's Chocolate Holidays - Desserts For Every Season! Chocolate answers and cures for winter, spring, summer and fall, some of the very tempting recipes include Chocolate Hazelnut Roulade, Bittersweet Chocolate Truffles, Irish Coffee Chocolate Mousse, The Ultimate Flourless Chocolate Cake, Chocolate Pound Cake, Broadwalk Bananas, Chocolate Pecan Pie, Chocolate Cream Puffs With Spun Sugar and more! To enter the giveaway, please leave a comment here on or before 17th January midnight India time. The book will be shipped to any address in India. The winner shall be announced shortly...hope you will participate!! Procedure : Center an oven rack and preheat the oven to 180 degrees C / 350F. Line two cookie sheets with parchment paper or silicone mats. Set aside. Combine all of the ingredients in a large heatproof mixing bowl, preferably stainless steel (make sure it has high sides to prevent water from the skillet spilling into it). The mixture will just come together and look like wet coconut. Set the bowl in a skillet of barely simmering water, the heat on low, and stir the mixture, scraping the bottom to prevent burning, until it is sticky and hot to the touch. This will take about 2 minutes or so depending on the kind of bowl you use and the quantity you are making. Just be sure to keep stirring constantly and touch the mixture often. Scoop rounded tablespoons of the mixture about 1 inch apart on the cookie sheets. Flatten each cookie slightly with a damp finger to resemble miniature potato pancakes. Stick some chopped chocolate bits here and there. Bake, in batches, until the cookies feel dry on the surface and the protruding coconut shreds are dark golden brown (this is difficult to make out really!) and the interior still looks like melted chocolate, about 14 minutes ( I baked for 16 minutes ). Bake a tiny test batch to determine the right baking time in your oven. Slide the parchment onto a cooling rack and cool the cookies completely before removing them from the parchment. Or, if using the silicone mats, cool the cookies on the sheets on the rack, and then, using an offset spatula, transfer the cookies from the mats onto the cooling rack to cool completely. The cookies are most delicious, crisp-ish on the day they are baked. They do taste good later too, but more chewier. These can be stored in an airtight container, for 4 to 5 days. Please note : I have grated the outer darker layer of dried coconut (copra) first, discarded it and then grated the rest before measuring. I find the darker portion makes cookies even chewier. If you find ready shredded dried coconut, use it. 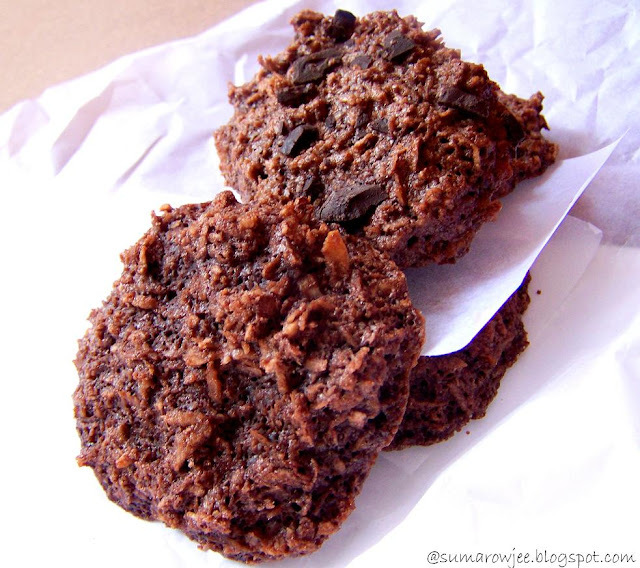 Do not reduce the quantity of sugar as the taste of the chocolate and coconut will come through only with enough sugar. Quarter the recipe and see how sweet you would like them. And absolutely, better chocolate will give you better taste! Wishing you and your family a very Happy New Year.And Happy Blog Anniversary Suma. I would love to be a part of the giveaway.Awesome book yaar. latkes are inviting to taste............ congrats on your 3rd anniversary. lovely giveaway dear. Awesome combination of chocolate & coconut. adding to my to try list. Hmm teh latkes look yum. I want some. Hey that is a rhyme. What else will happen if you keep wrinting rhymes (HW) all over on Suunday. Congrats on turning 3. and the book has my name on it. Thanks. Congratulations on the blog anniversary, Suma. Wishing you many more cherished years of blogging and your love :Baking. Was the dough sticky Suma? Wow these are tempting!!! and happy blog anniversary and wishing many more to come!!! Oops, just re-read and saw your note on the copra. Good to know. Thanks! Congrats Suma :) love your blog. Awesome recipe this. happy 3rd anniversary..this recipe is so simple yet appealing..keep up the hard work.. Happy Blog Anniversary!! Here's wishing you many more in future. the chocolate latkes look delicious and Thanks for the giveaway. Ive been a great fan of your blog since i discovered it. Happy blog anniversary! I came on here today looking for recipes using strawberries and found this instead! Would love to be part of your giveaway. This surely looks tasty. Since it's mostly coconut based, I'm sure this gives a nice distinct flavour that baked coconut gives. 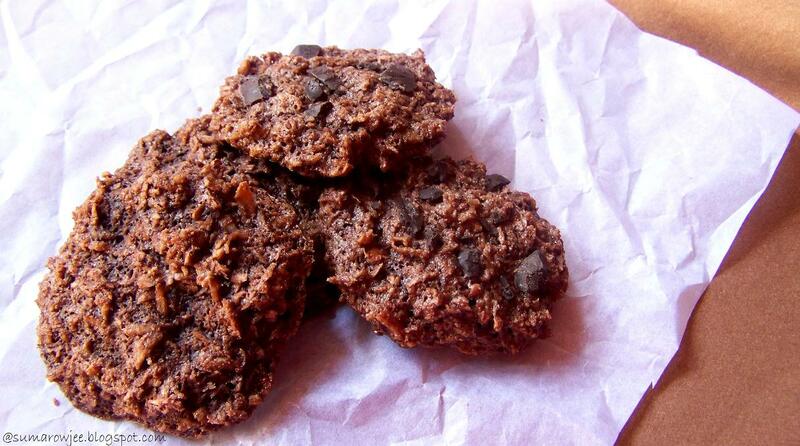 It's a guilt free recipe for the diet conscious....and with a touch of chocolate!!!!! Your piping gel recipe & shops selling bakery items have been of great help for me. Congratulations on the blog anniversary....and sure would love to be a part of the giveaway! ''Chocolate is the answer - who really cares what the question is?'' lol well said. I am drooling over these latkes! First time commenting, but have been a silent reader for long. I am going to try this, bookmarking now. Congratulations on your 3rd blog Anniversary. You have inspired me to a great deal to start a blog of my own as I am a big fan of baking myself. Love to follow you and all the amazing bakes and cooking. I am a self confessed choco-holic and these latkes are superb. Great going Suma. Wishing you many many more years of blogging! Am in love with those latkes, bookmarking it to make some soon. Wonderful giveaway too,who will say no to chocolate. You always seem to be reading my mind… I adore choclate and sweets, and always want these in January. Bring on the bakes! Alice Medrich's Chocolate Holidays - Desserts For Every Season! sounds like a lovely give away for the occasion. Wow! 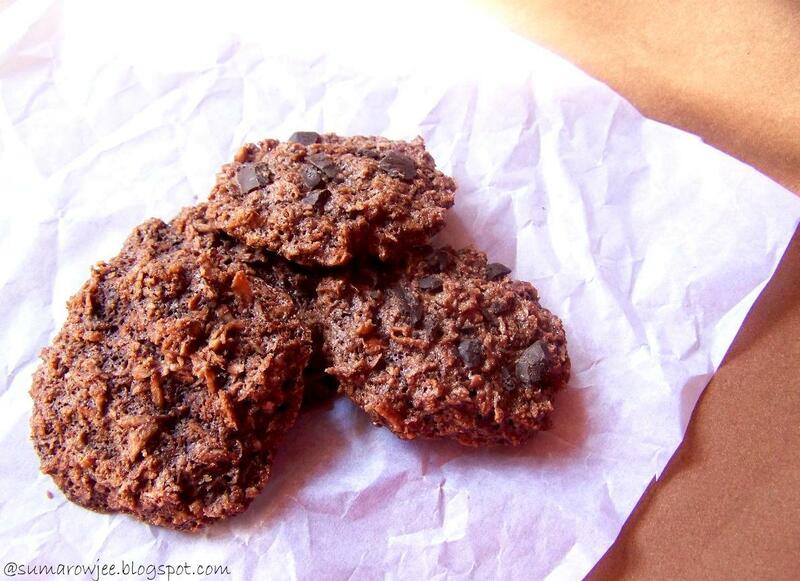 These Chocolate latkes look delicious! Is it 3 years already since I know you??? These 3 yrs have crossed so soon, can't believe! Congratulations Suma. You've evolved so well as a baker, it's inspiring and sure it reflects on this blog. Keep up the good work. Looking forward for more from Cakes n More to come. I make potato latkes frequently for dinner but this is such a lovely idea. Will try them for dessert (or even breakfast!) over the weekend. Congratulations on the blog anniversary - you are such an inspiration, not to mention a treasure trove of baking information :) Wishing you continued success always! Hugs. Congratulations on that fantastic note and turning 3 and managing the blog amidst of day to day add ups is not so very easy. I repent as to why I was away from blogging for 1 year. I am back now.